October is truly my favorite therapy month. I love all things fall and Halloween – especially pumpkins! I don’t drink pumpkin spice lattes, but I do eat pumpkin spice donuts and read pumpkin themed books! Today, I’m rounding up some fun read alouds that you can use this fall or Halloween in your therapy sessions! – How Questions – How to take care of a pumpkin? How to carve a pumpkin? – Compare/Contrast – Desmond is a field mouse and Clayton is a house mouse. These two characters are great to compare/contrast! – Problem Solving – How did they finally get it off the vine? They had to work together! – Synonyms – I think it would be fun to have students come up with other words for “big.” You can get some orange post-its and write a different synonym on each one! – Time Concepts – What happens during each season to Jack? In the winter, he’s covered in snow. In the spring, he’s just a pile of seeds. – Sequencing – Use this book to talk about the lifecycle of a pumpkin and sequence the steps! It’s a great way to incorporate science into speech! – Rhyming – You can even sing this story with your students! You can work on finding all of the rhyming words. – Sequencing – Work on the words first, second, third, fourth, and fifth! This is an easy book to use to help students use sequential vocabulary. – Emotions – I love that the pumpkins have different facial expressions! There are three happy pumpkins, a surprised pumpkin, and a scared pumpkin. The surprised pumpkin says “oh my, it’s getting late” and the scared pumpkin says “there are witches in the air.” I just love those little details! Students can practice different facial expressions and talk about feelings. – Social Skills – Talk about the things people did to the Ugly Pumpkin and why their behavior is unpleasant. Brainstorm ways to make the Ugly Pumpkin feel happy. – Compare/Contrast – Compare different pumpkins, they come in all shapes and sizes! You can also compare/contrast Halloween and Thanksgiving. 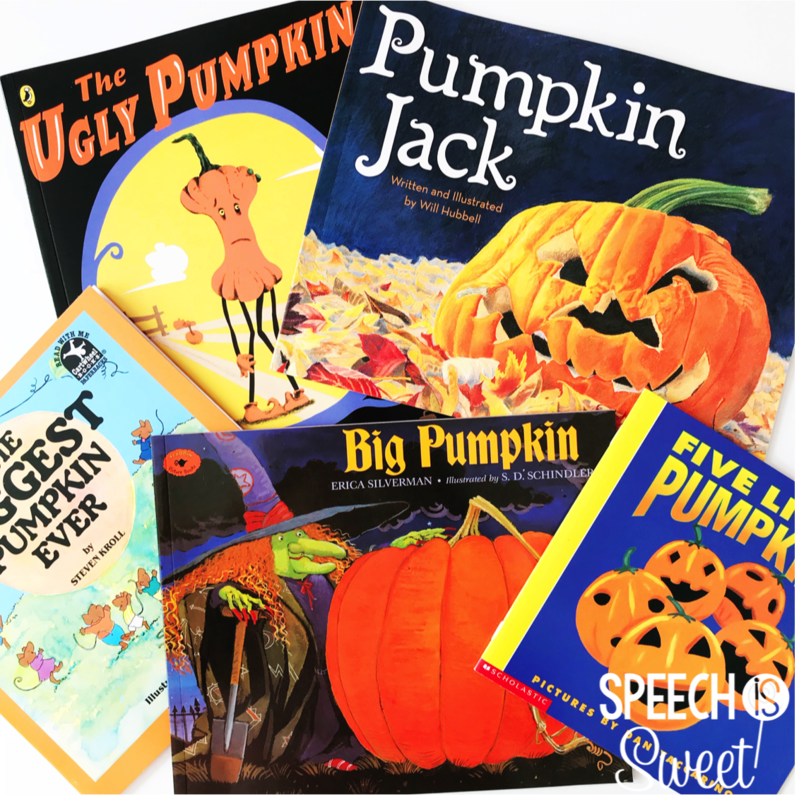 Do you have a favorite pumpkin themed book? Comment below and let me know! « Turkey Trick or Treat Freebie!